When purchasing food for your dog you will find that the selection of different types of dog food are mind blowing. With television adverts, Internet marketing and so called nutrition experts trying to vie for your attention a dog owner will find the whole, ‘what shall I feed my dog?’ question very worrying. Obviously you want to feed the best food possible so to begin with choose organic – but where to go next? To begin with try and avoid any food that has additives or colours to make the food more enticing. If you intend to use a complete food the chances are that the very cheap brightly coloured feeds are full of undesirable additives. They may not yet be illegal but they can still have your dog bouncing off the ceiling. Most major brands have healthy, holistic or organic lines and if this is your chosen type of dog food then follow that route. 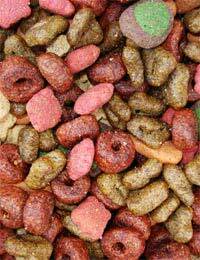 Remember to change the dog food gradually over a fortnight as instant changes can cause upset stomachs. If you really want a healthy food for your dog then go back to basics and give your dog a raw meat diet – after all this is what they would have eaten in the wild and you cannot get a more natural food that than. However, if you want to go the whole hog you need to purchase organic meat. Your butcher will be able to help with this as most butchers and even supermarkets now sell organic meat – but it will cost more. Try animal feed suppliers as these companies will deliver organic pet food as well as frozen raw meats including organic meat for followers of the raw meaty bone diet. This diet advises that only raw meat and bones are fed to a dog, even treats are banned and you never see an unhealthy dog on this form of food. Many people swear that years ago their dog just lived on table scraps and was the healthiest dog in the street. He may well have been in the days when we had meat and two veg most days but give him table scraps today and the dog will most likely be ill from an overdose of junk food. Many practitioners of holistic treatment will say that ‘we are what we eat’ so if an organic dog food is labelled as holistic it will mean that every ingredients is vital for a healthy dog. It is possible to buy treats that are made from healthy ingredients and are normally supplied by the same dog food suppliers. Organic food should by being labelled organic be holistic and a natural choice for your dog. It is all very well feeding your dog the best organic food on the market but you must look to his other needs as well. Exercise, grooming regular health checks and lots of love are just as important for a fit healthy dog. Remember to keep in touch with the breeder of your dog as he or she will be most knowledgeable about the food intake of the dog she bred. If you state your preferences she will be the one to guide you through the maze of organic pet food that is available for your dog.